This tasty soft and chewy multivitamin is tailored with a balance of nutrients and Omega-3. 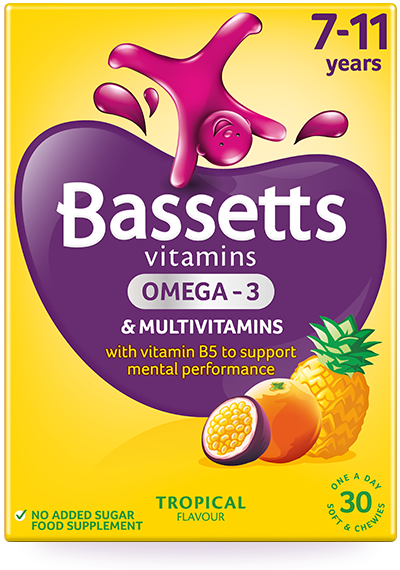 It contains nutrients to support the health of seven to eleven year olds helping them be bright-eyed and bushy-tailed, including Vitamins B2, B6 and B12 which help to release energy from food and Vitamin B5 to support mental performance. Riboflavin (Vitamin B2), Pantothenic acid (Vitamin B5) & Vitamins B6 & B12 help reduce tiredness & fatigue & contribute to the release of energy from food. Pantothenic acid (Vitamin B5) helps support normal mental performance & Vitamins B6 & B12 support normal psychological function. Sweeteners (Maltitol syrup, Sorbitol, Sucralose), Flaxseed oil (source of Omega-3), Gelatine (Bovine), Vitamin C, Vitamin E, Emulsifier (SOYA lecithin), Orange flavouring, Pantothenic acid (Vitamin B5), Acid (Malic acid), Glazing agent [Vegetable oil (Coconut oil, Palm kernel oil, Sunflower oil), Carnauba wax], Riboflavin (Vitamin B2), Vitamin B6, Passion fruit flavouring, Vitamin A, Pineapple flavouring, Vitamin D, Colour (Mixed carotenes), Vitamin B12. Contains naturally occurring sugars.